May 1 By Jen 8 Comments This post may contain affiliate links. Happy National Strawberry Month!! 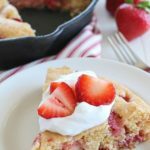 May is National Strawberry Month – woohoo! I love strawberries! They’re one of the few fruits that everyone in my family will eat. Strawberries just make things better, you know? Add strawberries into a green salad – amazing. 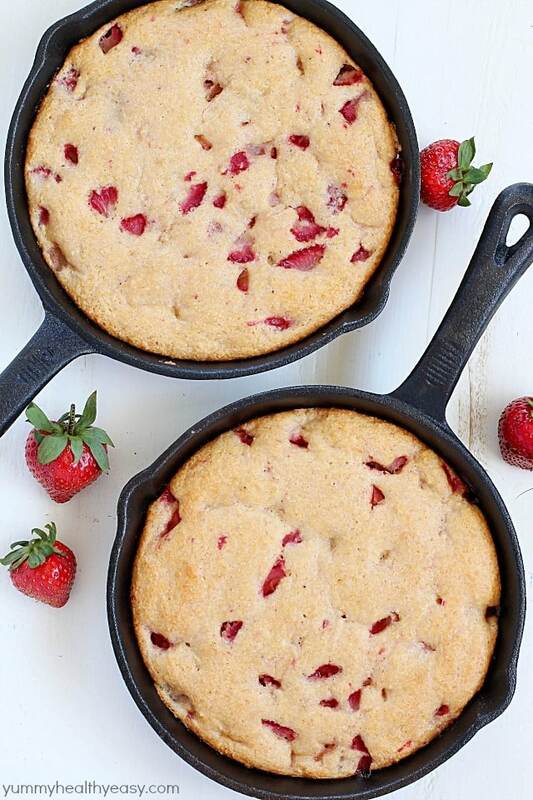 Throw strawberries into bread – so good. Toss them in a skillet corn cake? Perfect!!! I’m pretty sure my little skillets are one of the best things I’ve purchased for baking. I LOVE them! I’ve made dips, skillet cookies and now this awesome corn cake. 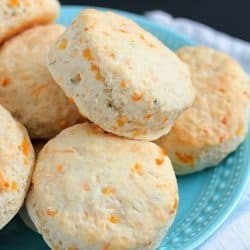 Corn cake is pretty similar to a corn bread but is a little sweeter. 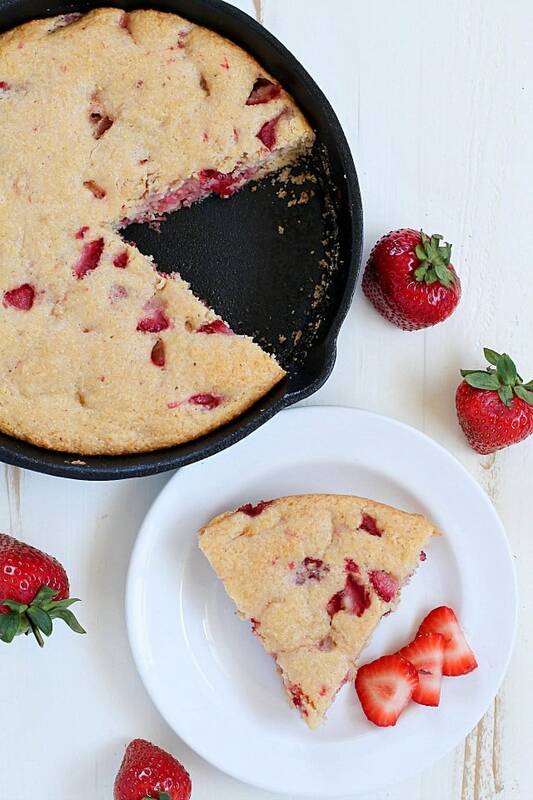 Adding strawberries just adds to that sweetness and flavor. It just changes up the texture so it’s not all dense cornbread. 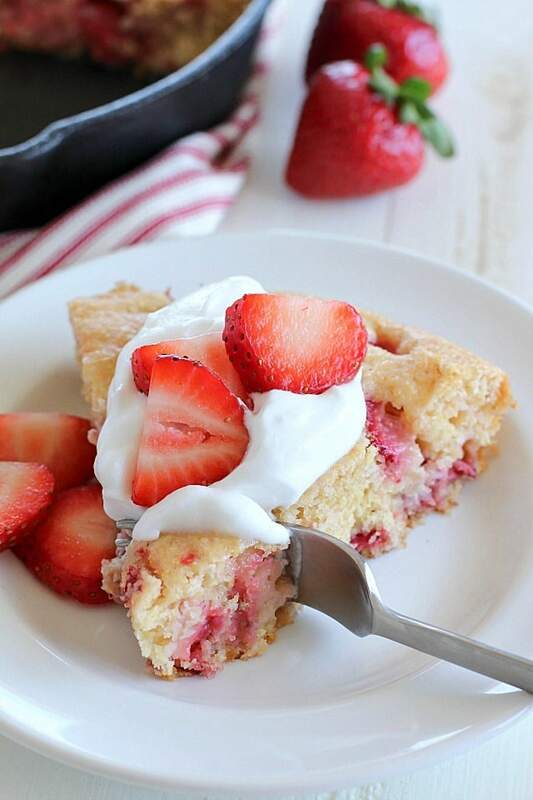 Dipping that fork into a soft corn cake and grabbing a piece of strawberry in the process really makes me happy! 🙂 Pretty much anything with strawberries makes me happy! 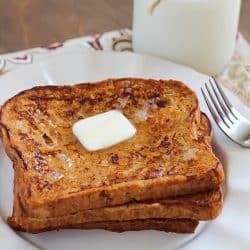 Add a dollop or two of whipped cream and some sliced strawberries on the top and you got yourself a yummy brunch, dessert or fun snack! 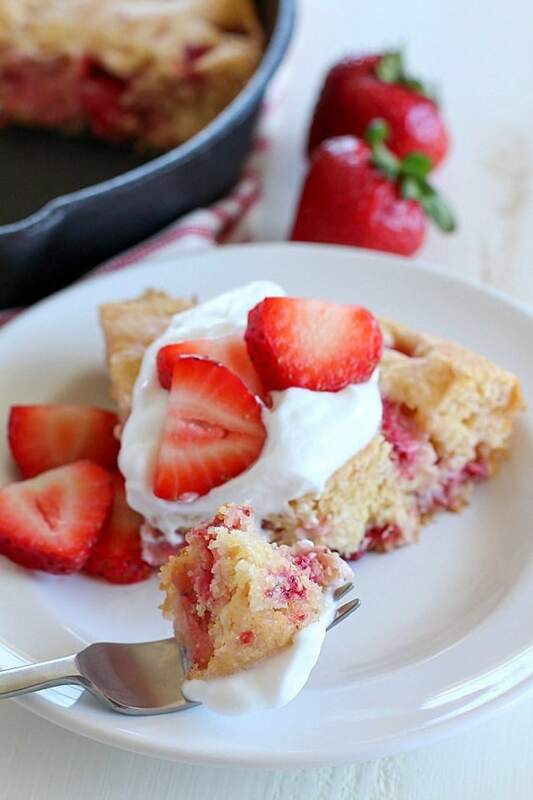 If you like strawberry recipes as much as I do, scroll down to get the recipe for this awesome corn cake and then grab 28 more yummy strawberry recipes!! Preheat over to 350ºF. Oil two 9" skillets with cooking oil. Set aside. In a large bowl, stir together flour, cornmeal, Truvia, baking powder and salt. 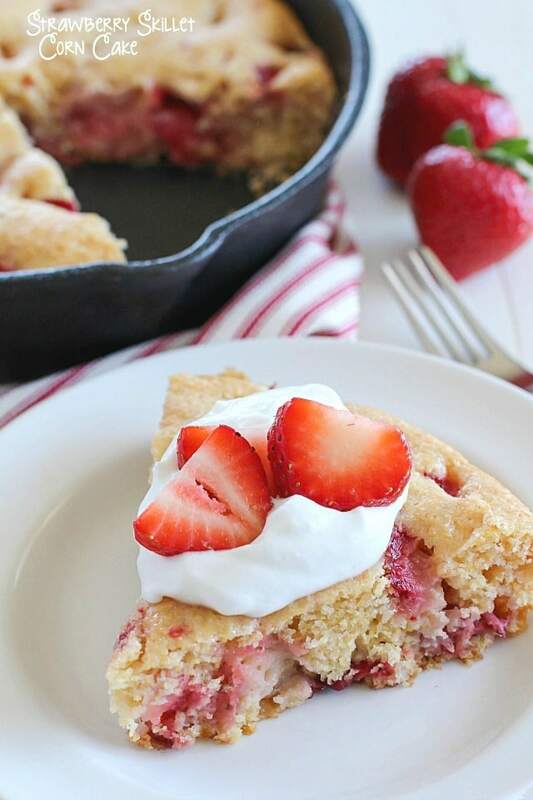 In another bowl, toss chopped strawberries in 1/2 cup of the flour mixture. In another mixing bowl, whisk yogurt, oil and egg together. Stir the yogurt mixture into the flour mixture, until just combined. Fold in strawberries. 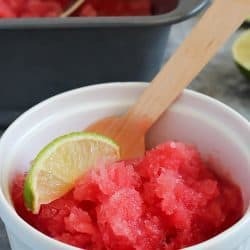 Spoon strawberries into prepared skillets and place in preheated oven for 20-35 minutes, or until tooth pick inserted in the center comes out clean. 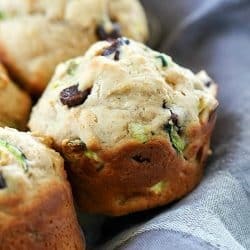 *This can also be made into muffins! 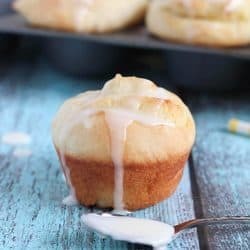 Follow directions above but pour into 12 greased muffin cups. Bake for 20-25 minutes, or until toothpick comes out clean. 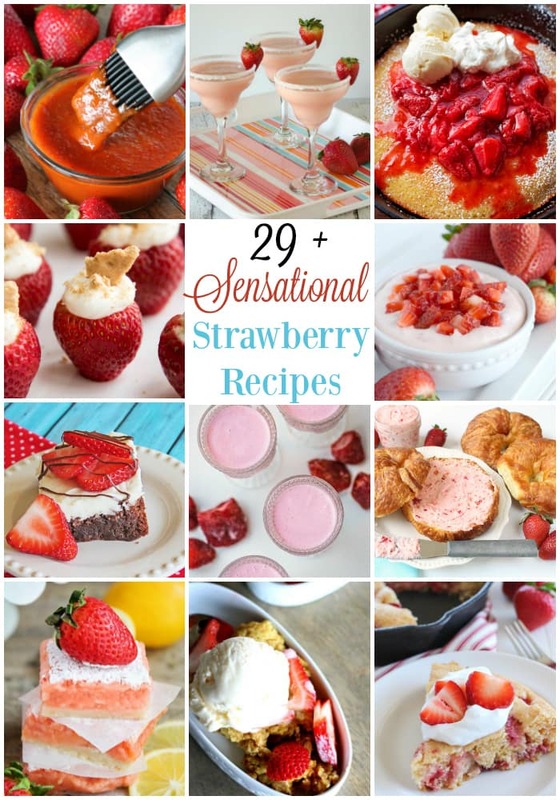 To celebrate National Strawberry Month, I’ve teamed up with some amazing bloggers to bring you 29+ AMAZING Strawberry Recipes! 12. Strawberry Shortcake by Jamie Cooks It Up! We love cornbread at our house, so I bet this corn cake would be a hit! I love that it has strawberries and strawberry yogurt. Yum! Thanks Liz! Have a great week!! This looks amazing Jen! 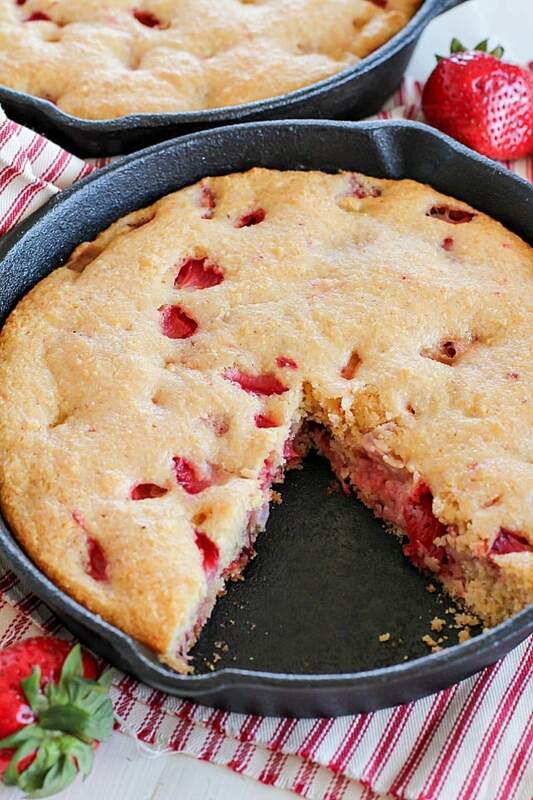 I love desserts made up in a skillet, and this needs to be the next one I try!